I thought I’d demystify how to create a custom pet portrait from beginning to end. My client asked me for a portrait of a recently passed away family dog named Dudley. Dudley was a beloved family pet and lived a long good life and they wanted a way to commemorate his life with a keepsake. How lovely! So as you can see above, I started with a simple line drawing using a thin paint brush. Then I added some fun under-paint colors. Why pink? I get that question a lot. I just love pink and I love how it vibrates with other colors when you lay colors on top of pink and have little hints popping through. Pink and green are also complimentary colors so I knew it would impact the fun wreath well. I then started painting the wreath. I didn’t do a fun under-paint color here… Why you may ask? No reason. I definitely could have done something under there and it would have made the leaves even more interesting but I decided to go a little more “traditional” on the leaves by starting dark green and building my way up to light green. I also got into painting the eyes and nose at this point and I kept these pretty traditional as well because I wanted to capture Dudley’s soul and expression here. 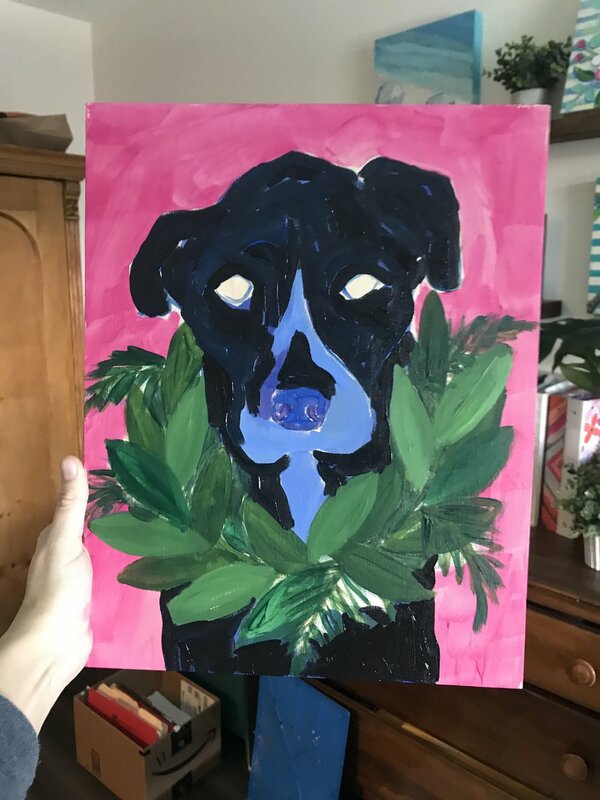 I touched base with the client and got some feedback on what background color she would want for the custom dog portrait. The client mentioned she liked gray and lavender and that Dudley’s iconic red collar was a must. I added in the collar and did some fun pastel highlights. I must tell you that when I discovered adding pastels to my paintings a couple years ago it was a GAME CHANGER. It just looks so fun and some of those colors and textures you just can’t replicate with paint so it really gave my paintings that colorful, whimsical edge that makes them look at little more eclectic, fun and spontaneous. I then went to painting the background color in. I decided on a grayish/lavender color (as per the client’s request) and I left hints of pink popping through (hard to see the pinks popping through on the photo but I promise they’re there). Then I sealed it, signed it and mailed it off the client. I’m really happy with this piece because I think it looks like the colorful pet portrait I was going for while retaining some of the realistic quality of capturing Dudley’s personality. If you are interested in a colorful and eclectic pet portrait of your dog, cat or rat ;) feel free to reach out to me or visit my Pets page. You may not have the best view of the event! I know… but how can you paint what you can’t see? Good question. Due to a million and one things that go into having a successful wedding like seating, flowers, photographers, wedding planners, the aisle, bathrooms, the bar, the rings etc… I was placed off to the right side of the seating area near where people entered the venue. This was cool in a way because people got to catch a glimpse of the painting as they arrived but it didn’t give me the best view of the ceremony as I painted. The saving grace here is to use a camera, phone or iPad to take photos as a reference so you can settle back into your seat and paint your little heart out. The weather is always changing! 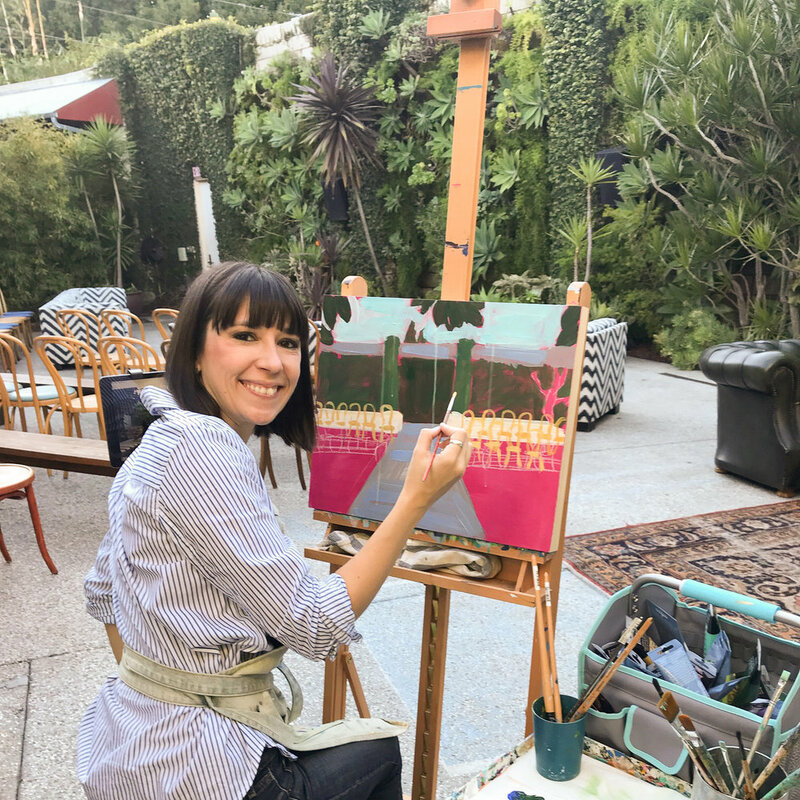 Duh, but… when I arrived at the Culver City, Los Angeles location I set up my easel and supplies and I was in full sun (hello sunscreen) which wasn’t that conducive to getting started but as the sun moved I was able to sit comfortably and get my painting done. As many people know who live in California while most of our days are beautiful and sunny it can get chilly at night in the winter and by 5pm the sun was down and a chill had hit the air. Yes, I’m a delicate flower so I was SO happy that I dressed in layers… when I got there it was blazing hot so I took off my sweater and was down to my collared shirt and when the chill hit I layered back up. Pack layers, ya’ll! Let there be light! Did you know most wedding ceremonies take place at sunset? Yes, I do… I mean they do! So you will start painting during daylight and end in total darkness. I had received this advice beforehand so I knew to pack an art light but I didn’t have anywhere to plug it in once I was there. And running a long extension cord would have ruined the look of the venue so I’d recommend anything battery operated that doesn’t make you look like a coal miner. Arrive early! My plan was to arrive two hours early to pre-paint the venue. That might seem like a long time but it ain’t! Man, did that time fly! #1 because some of that time gets eaten up by unpacking the car, finding the correct parking, unpacking and setting up your space. Then you’re taking photos and getting started so I’d say try to get there 3 or 4 hours ahead if possible. I know some venues don’t allow you to get there that early so you have to work with what you got but just like a job interview always better to arrive way early then cut it too fine and have pit stains in the interview.. or chic wedding. Under promise and over deliver! This is just a personal mantra but I’d rather really impress people than disappoint them so I didn’t promise the painting would be done the night of. Maybe I’ll get to a point where that is my goal but for my first live wedding painting I preferred to leave it open ended. Plus I like to varnish/seal my paintings when I’m done with them and there’s no way I could have done that at the wedding. So I got about 3/4’s of the painting done on site/live but then I finished it at my studio and sealed it and hand-delivered the finished product 5 days later! When you think about it this is pretty cool because most wedding photographers take 2 months to get the photos back to the newly married couple but their original painting they get to hang up almost immediately! I love me some instant-gratification! Your #1 Way to Earn Karma Points this Holiday Season! Best Cheat for Inexpensive & Easy Framing! Ever buy a cute print or an original piece of art on paper and then not know how the heck to showcase the thing you spent your hard earned dollars on? I get it! Framing can be a little overwhelming with all the size options, matte or no matte and the various styles of frames out there but I’ve come up with an inexpensive and easy way to get the job done… oh, and did I mention QUICK too!? Henry telling me to take him on a walk and STOP working already! How to have FUN when you Paint! About a year ago I decided to call my agents and tell them I would be "booking out" meaning I wouldn't be available for auditions for the inevitable future. This was a HUGE decision since I had moved to Los Angeles in 2008 with $1,000 in my bank account and a dream of making it big (preferably in my own hit comedy series)! As an artist obviously inspiration is very important and while I receive inspiration from trips I take and my environment and animals and even my dog I also gather a lot of inspiration from other artists that I admire! I've been a long time fan of Andreina Bates and over the last couple years we've exchanged messages of encouragement. Andreina has a very distinct style and I love her paintings. I like how her paintings have a very free and expressive look while still being recognizable for whatever subject matter she is painting. In my painting I'm always striving to be more free and loose and Andreina has nailed it. If you are interested in checking out her work here is her website: https://www.andreinabates.com/ or find her on social media. I'm a fan! 10 reasons to visit Austin ASAP! 1. Visit now (April) because the weather was great! Sunny days and a nice breeze but not too hot. We hear that once June hits it will be a nightmare so go now! 2. Hip restaurants! A couple we tried were The Launderette near Lady Bird Lake and Sawyer and Co. Both had a cool, hip retro feel and the food was good. We also went to Shady Grove which had more of a relaxed country feel but had a lovely big patio and the bathroom was a converted Airstream! 3. Texas Barbecue. When in Texas... we heard that Franklins was super popular but the wait is about an hour and a half so we opted for Terry Blacks (locally recommended) which by the way is also a top rated BBQ place and we walked right in. This place was really cool inside and the BBQ was really good. I'd never had Texas BBQ so I wasn't sure what to expect. We tried the sausage and brisket along with many sides. Our eyes were definitely bigger than our tummies! 4. Bars and Tap rooms! Boy do they like to drink in Texas. Go big or go home, right? So many cool bars on 6th and 7th street downtown plus all over the city in little niche neighborhoods. Also, I noticed a lot of games at all the bars which was fun. HUGE adult size connect four, beer pong and more. Also, pretty much every bar we went to had a stage so a lot of cool live music. My favorite was Austin, Eastciders because I don't like beer and LOVE cider so this was perfect for me! 5. Improv! We only got to hit up 2 improv theaters when there but a definite must if you want to laugh. First we went to Coldtowne and this was a small venue but friendly folks and laughs to be had. The second night we went to the Fallout Theater and this show was excellent! Both have bars so you can enjoy a drink while watching and laughing. 6. Nate's in Buda. This is further South from the actual Austin city limits but we found a really nice place called Nate's. Very cool hip bar with a sprawling patio with plush seating where you can sit in the breeze and let your city-troubles wash away. 7. Crawfish! Truth be told I didn't actually order any Crawfish but a nice local couldn't finish his and offered his leftovers to me. Usually I don't go around eating stranger's leftovers but when in Texas try Crawfish! The nice local taught me how to open the thing up and it was pretty tasty... only thing missing in my opinion was some melted butter. Yum, yum! 9. Downtown, Austin. Fun to walk around and see all the offerings the city has to offer. 10. The people! I didn't come in contact with one person who was mean, negative or nasty albeit I'm sure they exist but everyone was super friendly and eager to give us their recommendations! Thanks, Austin... we will see you next time!